City leaders want more people to use transit as they seek to grow Minneapolis' population, but several local urbanists feel some relatively simple improvements are being overlooked. Case in point: Bus stops. For many people unfamiliar with local transit, the bus system at a glance can be quite intimidating. University of Minnesota professor David Levinson has written extensively and recently at Streets.MN about what he has dubbed the "sorry state of bus stop signs" in the Twin Cities. Levinson argues that bus signs in the region provide too little information, particularly compared to other transit-friendly cities. “If you go to most bus stops in the city of Minneapolis, the bus stop sign says 'bus stop,'" Levinson said in an interview this fall. "Which is I guess better than not having a sign at all. But if you go to another city where they care about transit, the bus stop signs provide a lot of information about where the buses are going, when they run, what the schedule is." 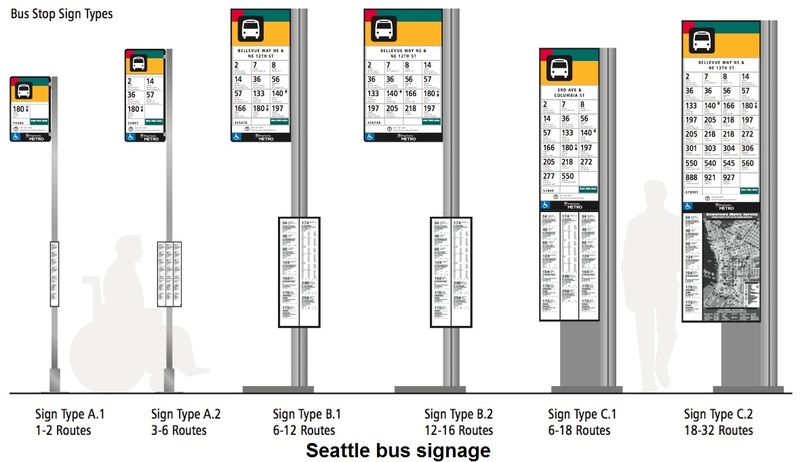 The basic "bus stop" sign is being upgraded to include unique stop identifier numbers (to track arrivals on a smartphone) and a Metro Transit phone number. Some higher-frequency poles and shelters include route numbers, route descriptions, stop numbers and timetables. Fewer feature a basic map of the bus route, as is often the case in New York (left) and Chicago. The ease-of-use of the city's bus system is important, since city officials are preparing to invest $60 million into a $200 million streetcar line partly to attract higher transit ridership. Streetcars run about the same speed as buses (page 7), but supporters argue they are more reliable and generate more economic development. Metro Transit spokesman John Siqveland said extra information is included at stops with the most ridership. About 900 of the more than 2,700 Metro Transit stops in Minneapolis contain information beyond "bus stop," he said. “In places, there are a majority of bus stops throughout the region that are just a 'bus stop' sign," Siqveland said. "But that doesn’t mean that’s where the customers are using the stops." 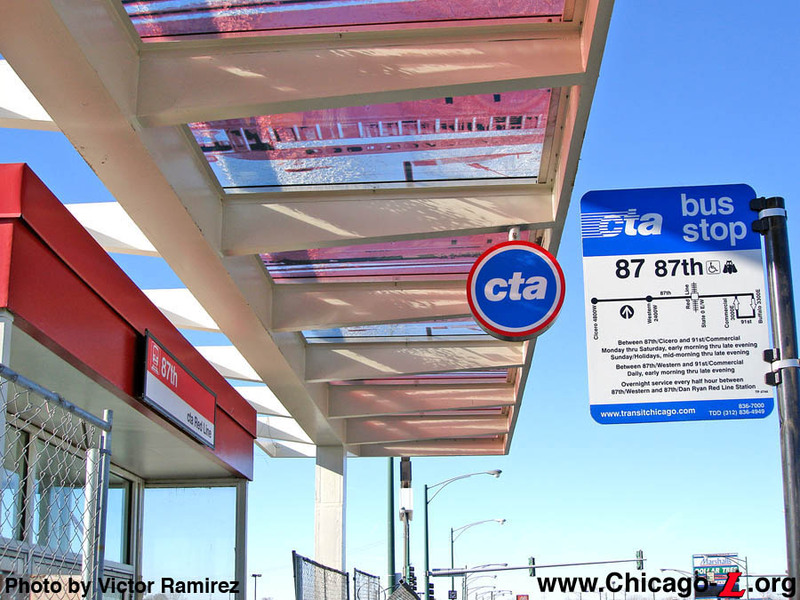 In his blog post, Levinson lists in order his priorities for what he thinks should be included at bus stops: station name, routes served, destinations that can be reached, frequency, hours of service, schedule, way to flag the bus, map of routes serving the stop, map of neighborhood around the stop, and several others improvements. Many of these are featured on Seattle's new signs (below). Siqveland noted that at transit centers, park and ride locations, rail stations, Marq2 (on Marquette Avenue) and on Nicollet Mall, stops feature much of the information Levinson is seeking. He said that they have prioritized providing more information online since 2010, based on feedback from customers. People new to the bus system can plan a trip on Metro Transit’s website, check real-time departure information on their phone with Next Trip, or use third-party tools like Google Maps and OMG Transit to navigate. Much of it assumes people have ready access to smartphones, however. Advanced research is important for using transit, Siqveland says. "If I’m going to drive somewhere new, I don’t get in my car and pull out of my driveway and expect that the street signs will – on their own – help me navigate there," he said. 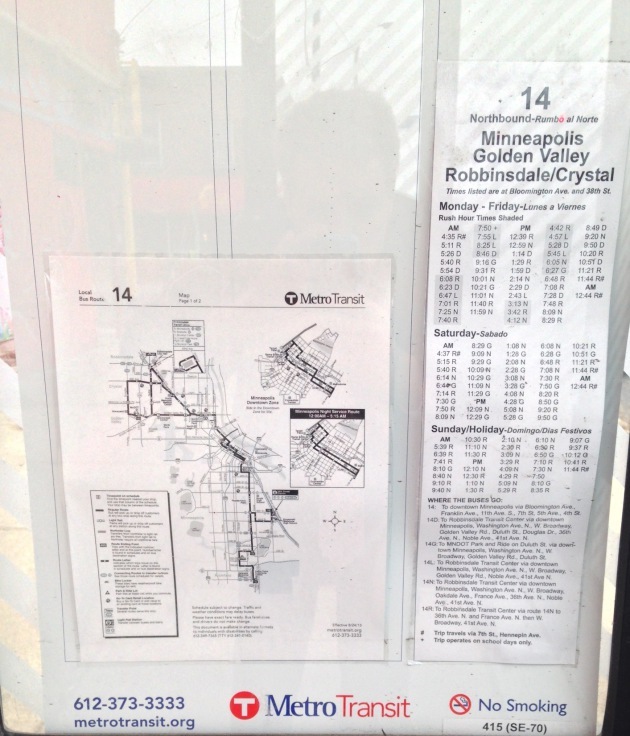 Route maps are perhaps the least common feature on bus signs in Minneapolis. At many heavily trafficked Hennepin Avenue shelters, for example, the information is limited to route descriptions and timetables (right). Siqveland said a "couple hundred" of Metro Transit's shelters across their network include them (example below from South Minneapolis). Maps of the entire system are featured at newer major transit hubs like the Chicago-Lake Transit Center. The Uptown Transit Center will soon be upgraded to include system maps and real-time arrival information, Siqveland said. There are about 885 shelters in Minneapolis and St. Paul, according to a recent city staff report. Siqveland said many of the shelters (about 330, based on the staff report) are owned by CBS Outdoor, which offers limited space for transit information. When they have space in Metro Transit-owned shelters, they prioritize schedules and then add maps if there is room, he said. A study cited by Levinson shows that signage and stop improvements are among the most cost-effective improvements to improve bus ridership (page 10). Annual reports from Metro Transit show that core urban route ridership increased .7 percent in 2010, 3.9 percent in 2011 and remained flat in 2012. It appears that there is an interest for better signage among riders. On Monday morning, Metro Transit posted on its Facebook page asking riders to take a survey about bus signage. "How hard would it be to put maps of the routes in the shelters?" asked one commenter. "The transit system here is actually pretty good (and I live in Edinburgh with an excellent bus system) but the signs outside of downtown are horrid. Little to no information and not helpful at all. I think you'd have much improved ridership and ease of use if some basic info (route numbers, schedule) was provided at every stop, not just downtown," wrote another commenter.